Never in recent history has the Islamic world faced challenges of a magnitude it faces today. Islamic assertion has been identified as the main threat to western hegemony following the collapse of the Soviet Union and the end of the bipolar world. Understandable resentment and anger at mindless acts of individual or group terrorism, of which the attacks against US targets of September 11 were most condemnable, are being exploited for purposes of real politick; to subdue States containing strategic energy resources; to impose a new era of (camouflaged) colonialism in large parts of the Muslim world and to confront genuine freedom movements including the Kashmir and Palestinian struggles. The Islamic world faces a near monolithic wall of suspicion and fear in respect of the alleged nature of Islamic resurgence and revival, indiscriminately seen as extremism and fundamentalism. The disinformation fostered world-wide, fuelled by activities of certain fanatic Islamic groups themselves, has produces a meeting of minds between the west, Russia, Israel and India, each of them with vested interests of their own. Force will continue to play the role of a supreme arbiter of international conflicts as long as the spirit of Karbala is not imbibed by Muslims. Today the United Nations finds itself incapable of implementing its charter obligations of pacific settlement of disputes, safeguarding of human rights and helping peoples subjected to aggression and occupation. 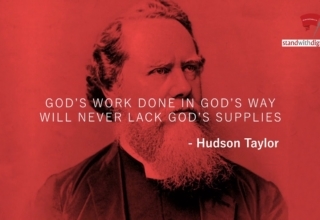 While many brave men and women have laid down their lives for worthy cause, the citadels of oppression will fall only when the people as a whole make a conscious desiccation to render, if necessary, the ultimate sacrifice when the worth of the cause so demands. This has been shown by the success of the freedom struggles in places such as Algeria, Vietnam and Afghanistan. In the milieu of our feudal society, Islam has been deprived of its progressive, humanistic spirit and relegated to a set of rituals and shibboleths. In a major part of the Islamic world, the dictates of justice and humanity (the essential engine for all progress, social or economic) are hamstrung by the vested interests of self-seeking regimes. 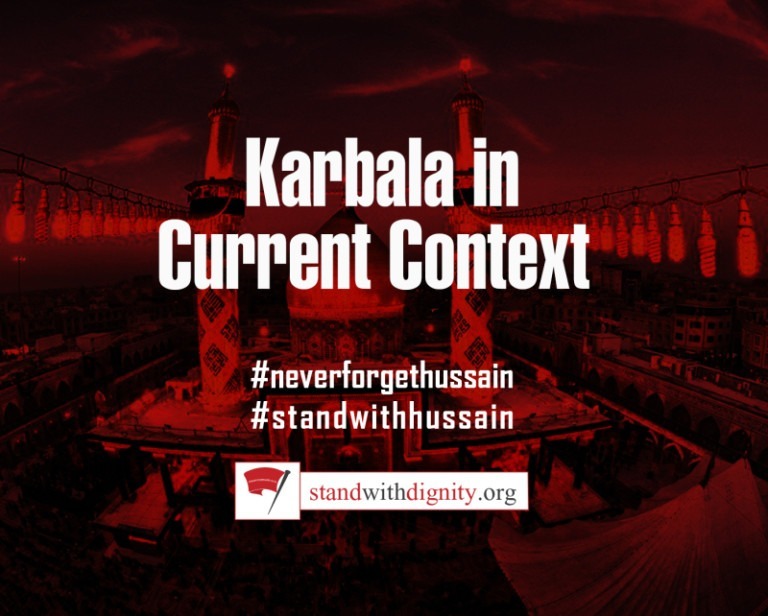 If the lessons of Karbala were to be assimilated involving readiness to risk narrow, vested interests for a just cause, oppression and injustice would not flourish with such ease. It is only when people or States are afraid to stand up and be counted that oppression thrives. How aptly has a German historian referred to this phenomenon when he wrote about the Hitlerite era: “First they came for the Jews and I did nothing because I was not a Jew. Then they came for the Communists and I was not a Communist. They then came for the Catholics, while I was a Protestant. And finally when they came for me, there was no one left to stand up and be counted!” This applies to the international arena as much as it does to the domestic challenges within a State. 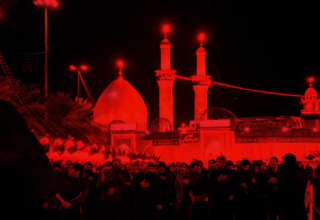 The foundation of Karbala’s heroic saga lay in the realization by Imam Husain that the challenges in the Yazidi era to the pristine values of Islam were much too dangerous to be overcome by force of arms alone, the outcome of which would have been transitory, as of all military confrontations. He sensed that only the example of a supreme, conscious sacrifice in all its manifestations could breathe lasting life in the beleaguered body politic of Islam. When he set out on his last journey with his family and a handful of followers, he had no illusions of a military victory over the formidable forces of Yazid, irrespective of expressions of support from some people in Kufa. 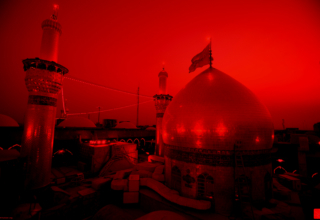 Nourished in the arms of the last Prophet, Imam Husain had an inspired vision of the future. He seems to have visualized the tragic martyrdom of the progeny of the Prophet, the parading of severed heads on lances, the brutality inflicted on women and children in captivity. 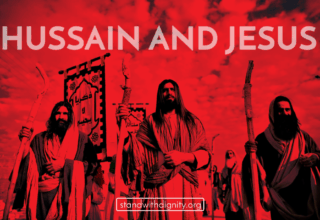 It was thus that Islam received at Karbala the shining beacon of sacrifice for a principle, a most comprehensive paradigm of courage and conviction, of faith and fortitude. Courage, moral and physical, is not only a virtue in itself. It is in fact a security for all other virtues such as integrity, rectitude, probity and piety, all of which depend for their sustenance on the strength provided by moral courage. In this context, courage implies basically the willingness to bear difficult and, if necessary, offer the supreme sacrifice for a cause, which has to be worthy enough of the sacrifice. In this world, with more than its share of trials and tribulations, there is no character-quality more important than a sensitive, social conscience. In listening to the saga of Karbala, one achieves a heightened sensitivity, sharpening one’s receptivity to human suffering and pain and blessing us with compassion and kindness for all people afflicted with sorrow and anguish. The feelings evoked by the martyrs of Karbala should, if properly assimilated, melt the heart into compassion for all victims of oppression, injustice and torture. Those among us, exposed to the tales of Karbala, but lacking human awareness and compassion have tragically missed the heart of the revered Imam’s message. That a monumental event like Karbala, which should bring all Muslims together in sorrow at its tragic aspects and in pride at the epic achievements of the martyrs, should be turned into an occasion for inter Islamic feuding in Pakistan, is a matter of great shame. 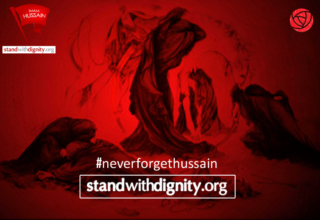 Karbala should be commemorated to cement Islamic bounds, not to send them asunder. It is the duty of the ulema, the media and the intellectuals to interpret the unifying nature, in fact, the universality of the message of Karbala to the people. Religion teaches nothing, nothing at all, if it does not teach respect for others’ Feelings; avoiding injury to the sentiments of others is the only way of coexisting in a multi-denominational society.